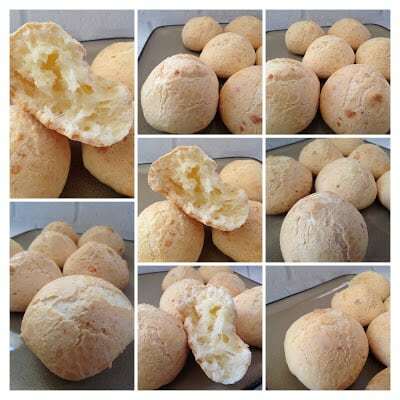 Pão de queijo are basically a slightly bigger version of French gougéres. French gougéres [goo-ZHEHR] is a choux pastry that is piped into a ring or ball shape before being bake. We have made gougéres many times here on Turnips 2 Tangerines. Gougéres can be served hot or cold as an hors d’oeuvre or snack. 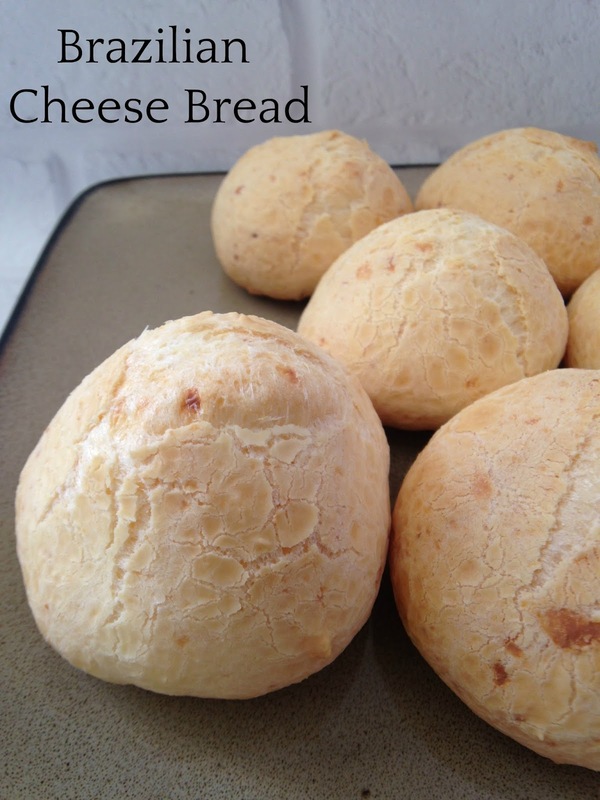 They have become a real favorite, along with these Brazilian cheese rolls. 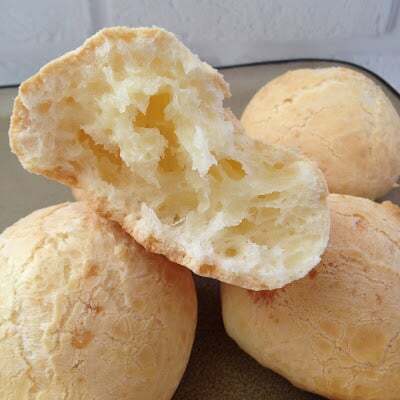 Like gougére, the dough for pão de queijo starts on the stovetop, then eggs are beaten into the dough, one at a time and the end result is a delicious, crispy, cheesy, chewy puff/roll with air holes, that make them very light and airy. The biggest difference between the two is the flour. 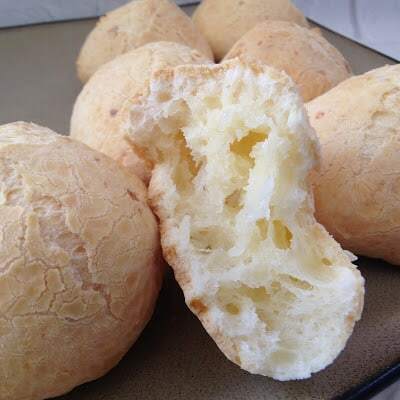 Pão de queijo are made with sour cassava flour or tapioca flour and Gougéres are made with all-purpose flour. Pão de queijo are chewier and more bread-like than their gougére cousins, which makes them perfect to dunk into feijoada, Brazil’s most famous regional dish. 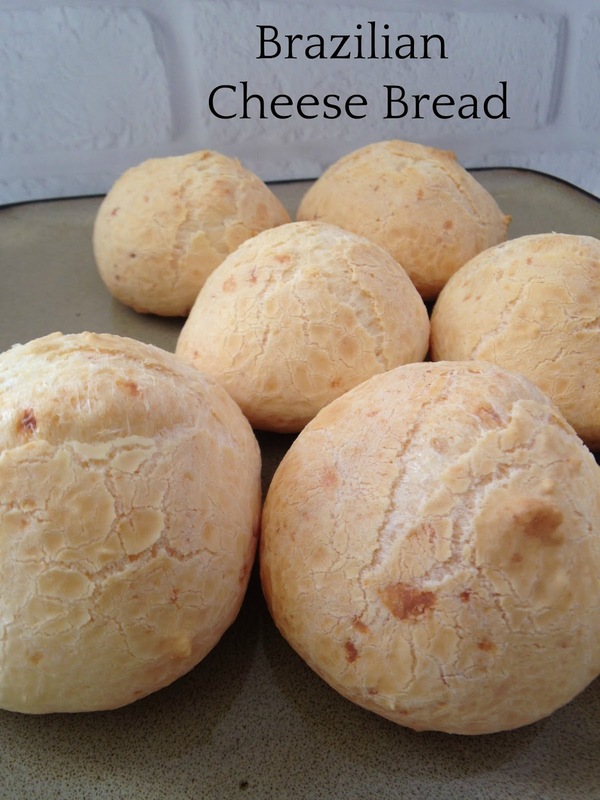 Pão de queijo have a mild cheesy flavor, thanks to the addition of shredded/grated queso fresco cheese. You can find queso fresco cheese at most supermarkets. It’s the highly sought after cheese used in Mexican, Cubian, Spanish and South American recipes. Queso fresco cheese is loved for it’s mild flavor and creaminess when melted. Both gougéres and pão de queijo are easy to prepare, delicious and quite frankly, should be prepared more often, like everyday! Well, ok maybe not everyday but definitely anytime you make soup, stew or chowder. If you have never used tapioca flour before you are in for a real surprise. Tapioca flour turns into a gelatinous, sticky, paste-like mess. It looks more like something you’d use for your kids art projects than something your going to add cheese too, bake and then eat! But rest assured, this stuff makes the best cheese rolls you’ll ever eat. Chewy, cheesy, and delicious. Perfect to serve with soup, stew or chowder. Place milk, oil, and salt in a medium saucepan; bring to a gentle boil over medium heat, stirring occasionally. Remove from heat when you see big bubbles coming to the surface. Add all of the tapioca flour and stir with a wooden spoon until you see no more dry tapioca flour. The dough will be grainy and gelatinous at this point. Transfer the dough to a large bowl. Beat the dough for a few minutes at medium speed until it smooths out and has cooled enough that you can hold your finger against the dough for several seconds. With the mixer on medium speed, beat the eggs into the dough one at a time, waiting until the first egg is fully incorporated before adding the second. Scrape down the sides of the bowl as needed. Beat in the cheese on medium speed until fully incorporated. The resulting dough will be very sticky, stretchy, and soft. It will not be completely smooth. You may need to add additional tapioca flour at this time to achieve the right consistency. Have a small bowl of water ready, dip the scoop into the water if necessary, then dough, by level tablespoons onto the baking sheets, spacing them about 1 1/2-inches apart (24 per baking sheet). For larger puffs, scoop the dough with a small (1 ounce or 2 tablespoon) ice cream scoop, spacing them about 2-inches apart (12 per baking sheet). Dip your scoop in water between scoops to prevent sticking. You can also roll the puffs between your palms, rolling them into the size of golf balls, wet hands often to prevent sticking. Place the baking sheets in the oven and immediately reduce the heat to 350°F. Bake for 15 minutes. Rotate the baking sheets between racks and from front to back. Bake until the puffs have puffed, the outsides are dry, and they are just starting to turn golden-brown on the bottoms, 10 to 15 minutes more. Cool for a few minutes and eat warm. Notes: *Look for sour cassava flour or sour tapioca flour at Latin American markets. Plain tapioca flour lacks the slight sour, fermented flavor, but makes a great substitute. You can find plain tapioca flour from Bob's Red Mill at most natural foods stores. *Portion the dough onto the baking sheets and freeze until solid. Transfer to resealable freezer bags and freeze for up to 1 month. Bake frozen for the same amount of time. I frozen a batch of pão de queijo and they turned out beautifully when I baked them.